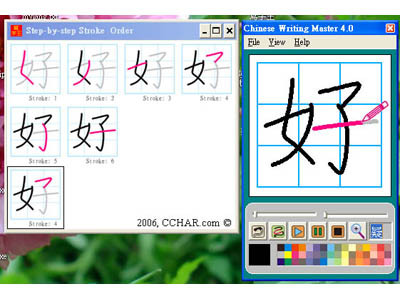 (1) Multilingual User Interface:Chinese Character Master 4.0 can be easily translated to any language by modifying a single language text file(mylang.txt). (2) Characters library: Bundled with a Simplified font library. Traditional character font is optional. (5) No Chinese Input Method knowledge required: Just copy a chinese character, the software will auto detect and display that character. Note:You can highlight a chinese character and press \'Control-C\' to copy. (8) Alternate stroke color toggle:A character can have many strokes. Alternate stroke color making a character to replay on 2 alternating colors, so the users can see more clearly what current storke is drawing. Planetsofts.com didn't scan Chinese Writing Master Standard Edition for viruses adware, spyware, or other badware. For safety reasons, we recommend that you always keep an updated antivirus installed on your pc when downloading and installing software from the web.